Being a passionate and creative cook helped Sunanda through this journey and she decided to utilize her skills and knowledge for the greater good. That’s how Green Pantry was born. Being a mother of two amazing girls doubled her passion for creating healthy eating habits. On this journey of her she met Sudeepta in a children’s park who also happens to be a mother of two beautiful girls just like herself and recognizes that she shares the same passion of healthy eating and living. As the days went by they discussed food, food and only food. Not only that Sudeepta was into the same space of serving health food to day cares. 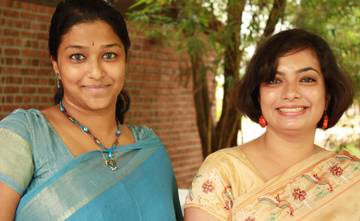 I am a mother of two girls (seven and three years old) and have been living in Banglore for the past four years. I first realized my passion for food and baking while living in the San Francisco bay area (USA) and decided to start something in this space after I got back to India. While in the US, I took courses in the business school at Berkeley to equip myself with the basics of setting up a business. What is the story behind starting up Green Pantry? My entry into the food industry began after my second girl turned two. I started catering for corporate events, initially cooking right from home. After sensing enough demand for gourmet catering and a positive response to my service, I decided to expand. At this point, my expansion plans intersected with my passion and love for giving back to society. I got in touch with the Spastics Society of Karnataka and got to know that they run a baking unit and have a functioning kitchen. It was then that Green Pantry was born. We work out of the kitchen at Spastics Society while training their differently abled students in the basics of cooking and baking. My vision is to setup Green Pantry health food cafes in all the major corporates and clubs in Bangalore while simultaneously working with the kids and women supported by Spastics Society. My partner in this vision is my good friend Sudeepta Banerjee, also a mother of two small girls. What is work-life balance for you? One of the biggest reasons I decided to chart my own course is for flexible work hours. Being my own master, I am able to drop my daughter at school at 8am and pick her up at 3pm. I restrict my main working hours from 8am to 3pm and ensure I am able to spend quality time with my kids during the evening. I shuttle them to classes and put them to bed every single day. Of course, none of this would be possible without the immense support of my family and friends. Where do you see Green Pantry 3 years from now? By 2017, Green Pantry wants to employ a 100 women, expanding 10-fold from the current roster of 10 women. "Empower 100" is the vision we are working towards. Go for it! Support will follow. Follow your passion and dream big. Your kids love you and understand you and I can't think of a better feeling than being able to cuddle up with my daughters after a long day at work. Fleximoms really helped motivate me and give me the confidence that I can balance work, family, and kids effectively. Discuss and talk to more mothers/women. I have found support at every step from the most unexpected quarters.